Here is a fun tutorial on how to tie-dye tissue paper to create fun and one-of-a-kind Tie-Dye Wrapping Paper. If you’ve following my blog very long, you know I am a HUGE fan of tie-dye. In fact, I’ve dubbed myself Tie-Diana. My love for tie-dye runs so deep, that I am always trying to think of new colorful projects. I recently came up with the idea of tie-dyed wrapping paper. After some testing, I discovered that I would need thin paper to be able to absorb the dye. The only thing thin enough that I could find was tissue paper. I tested the tissue paper out with the fabric dye and it just soaked through and the colors became muddy. I discovered that a much easier and cheaper option is food coloring. It soaks into the tissue paper really well and washes off your hands easily. Plus it’s super easy to do! Fold the tissue paper back and forth accordion-style, which each fold being between 1 and 2 inches. Accordion-style is a zig-zag fold like a paper fan. Fold that strip into squares or triangles accordion style. Wrap a rubber band around the paper shape to section off colors. The rubber band should not be real tight. It’s more of a marker for you to know where to apply color. Squeeze the desired color into each section of the paper shape. Turn the shape over and apply the corresponding colors to the backside, making sure to cover up all the white. Make sure to apply plenty of dye to the edges. Lay the shape flat on a double layer of paper towels and let it dry. It’s important that the tissue paper is fully dried before you unfold, so allow plenty of time to dry. I gave mine a few days. Remove rubber band and carefully unfold the tissue. The folds may stick to each other, so gently peel apart. Iron the tissue flat. I was not able to get rid of all the fold lines with my iron on high. Run the iron over quickly as to not overheat the paper. 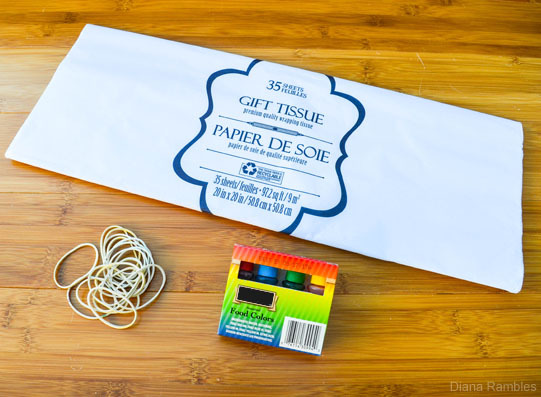 Use the paper to wrap a gift or in a gift bag. This was a really fun project and I am pleased with how it turned out. I tested out a variety of folding techniques and was surprised by the various colorful outcomes. I was very meticulous with my folding and application of dye, yet I found the paper turned out differently for each pair of dye jobs. Here is how the various folding turned out. The right column shows the fold and coloring techniques and the left column shows the two outcomes. Each year I wrap our Christmas presents in different designs for each person. This year I will create tie-dye wrapping in a different design and color scheme for each person. That is going to be one colorful pile of gifts! Who do you know that would love a new shaver this year? Will you wrap it in the colorful paper? That is such a neat idea! My boys would have fun making this with me. Pinned.